Andrew Niccol’s filmography as of late has been nothing short of disappointing. The writer/director once showed promise as one of cinema’s next great visionaries with his directorial debut, “Gattaca.” Since then, his career has had its ups and downs. “Lord of War” was a bold look into the world of arms dealing, but he followed up that excellent dark comedy with “The Host” and “In Time,” two all-around lackluster studio pictures. They’re safe movies, missing Niccol’s personality and eye for moral ambiguity. With “Good Kill,” Niccol returns to his roots with a movie that exists firmly in the grey. 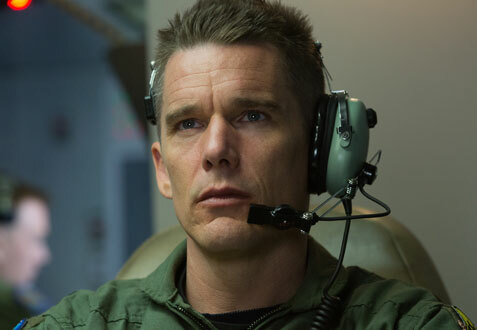 Air Force pilot Tom Egan (Ethan Hawke) is no longer fighting wars in the sky. Now operating as a drone pilot, he attacks from a box in Las Vegas, Nevada, far away from any serious danger. As a man who served six tours of duty in the sky, this doesn’t sit well with Tom, because even though he gets to spend more time with his wife Molly (January Jones) and their kids, he feels like a coward for having to fight like he’s playing a video game. At the start of the film, Tom is in bad shape, but once he and his fellow drone pilots, including Vera Suaraz (Zoe Kravitz), start taking questionable orders from the CIA, his job and life crumbles. A soldier haunted by what he’s seen has been well covered on film by this point. Tom Egan isn’t exactly a new or fresh character, but drone warfare is a new world, and it’s one that Niccol fully dives into, leaving no morally complex stone unturned. The writer/director shows all facets of drone warfare – both pros and cons – and the film highlights a variety of perspectives, not only Tom’s. This isn’t an anti-war picture, it’s an honest war picture. Niccol is as focused, if not more so, on drone warfare than he is on Tom, but Ethan Hawke never allows the character to be overshadowed by the film’s engaging world. This is the third time the actor has collaborated with Niccol, and the two men were apparently born to work with each other. Hawke has now played three characters for Niccol who are limited or held back by the worlds they inhabit — a common theme for the writer-director. In “Gattaca,” “Lord of War” and “Good Kill,” Hawke’s characters can only achieve a certain goal by breaking rules. All three characters make different choices, and each time out, Hawke has made that journey emotionally engaging. The actor exhibits a level of vulnerability that few movie stars are capable of. Sometimes, Andrew Niccol’s ideas are more fleshed out than his characters or stories, but that’s not the case with “Good Kill.” Tom Egan’s journey hits almost every beat an audience expects, but it does so rather gracefully. The only dramatic notes that lean on the weak side involve Molly. January Jones is an actress that rarely ever feels present. To be fair, she’s stuck in a reactionary role, but a better actor could’ve elevated the character. 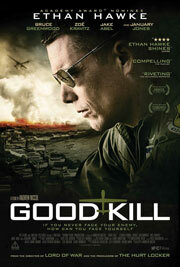 “Good Kill” is certainly a return to form for Niccol. This isn’t some triumphant comeback for the filmmaker, but it’s a step in the right direction. It’s a confident picture with a controlled and isolating atmosphere, a commanding lead performance, and questions that’ll linger once the credits have rolled. Fans of “Gattaca” and “Lord of War” will be pleased to have this Andrew Niccol back.